For Christmas this year, we decided to seriously cut back. Now, I am quite frugal and I am a very good planner/organizer, so Christmas' in the past have not really cost us that much anyway. I would typically shop all throughout the year as sales happened, and pick up some awesome gifts for a fraction of the cost. This year, however, we decided to go a different route. There are several reason for this change. 1. We don't have much money, and the money we do have we are saving. Ben will be officially "laid off" from his job as of the 1st of the year. He has been job searching and applying everywhere, but nothing has developed. We know God has a plan and a good job for him, and believe that God will provide any necessary finances in the meantime. We are choosing to be wise with the money we have and save it. 2. Our children are getting older and I really want them to understand the true meaning of Christmas. I don't want my children associating Christmas with gifts, money, who spent the most on them, who got the better present, etc. I want them to understand that gifts do not have to be fancy, expensive, or even bought at the store. I want them to consider investing their time to make something special for others. And so, that leads me to today's post-homemade Chai! Chai lattes are one of my favorite drinks. I don't, however, enjoy spending lots of money on them. 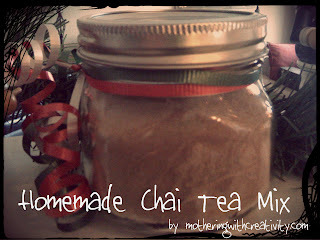 Seeing as I have some family members and friends who also love Chai, I thought that I would make a few batches of homemade chai to give as gifts this year. My husband and I both just finished our first cups of chai (mine with milk, Ben's with water), and they were sooooo delicious! I am more than happy to replace my store-bought chai with this cheaper and more delicious homemade chai. And, since this is such a simple recipe, it is very easy to include children in making it! Mix all of this together well. Then put the mixture, 1 cup at a time, into a food processor (or blender or coffee grinder). Grind well until it is a smooth and even texture. To serve: mix 2-3 heaping teaspoonfuls with a cup of hot water or hot milk. Enjoy! Note: You can also replace the French Vanilla Creamer by mixing 2 teaspoons of vanilla with the sugar (add 1/2 cup sugar, so 2 cups total). Let the sugar mix dry completely. Once dry, break the sugar into pieces and continue with the recipe as listed above! This option will save you around $1.50 off of the cost of the recipe! I had another cup of this tonight. It is so good! It's perfect because you can totally adjust it to your liking...leave out spices you don't like, add more of the ones you do. I hope you ladies enjoy it!